Since 2007, Dirk Bell has been working on the creation of an alphabet (LOVEPHABET) formally based on the shape of the square. He has been using this visual alphabet in order to create linguistic grid structures, spreading words over walls and objects and even making up rooms. Lacking a clearly determined beginning or end, they are readable in several directions and form geometrical, ornamental palindromes continuing ad infinitum and charge the emerging room linguistically with meaning. Like a motto, already visible from the outside, a three-dimensional grid is installed in the window next to the entrance. Consisting of wood and of steel alphabetic characters reading “SCHÖN UND GUT“ (beautiful and good), the object reminds of a rack or a bookshelf. The words take up two concepts from classical ethics and aesthetics – two categories that have been considered as interrelated or even mutually dependent since antiquity. As regards Bell’s geometrical alphabet, one may think of the platonic idea of the good that is always the beautiful which is characterised by the measure and proportion. The formal affinity to an empty shelf invites the visitor to charge the two traditional categories with a fresh meaning. In the main exhibition, there is a room-dividing grid structure that is made up by the repeated sequence DENKEN (thinking) that results in ENDE (end). 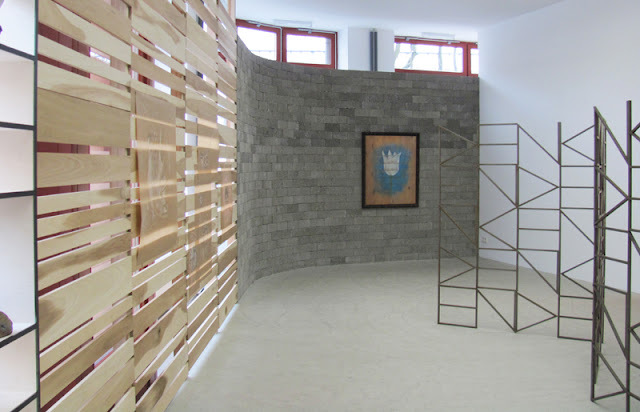 Two further three-dimensional shelf-like grids, HAH and AHA, are installed on the wooden wall of the exhibition space. The artist subtly combines thinking (DENKEN) with knowledge (AHA / I see! ), and the end of thinking (DENKENDE…) with laughter (HAH) that is always tied to a loss of the subject. 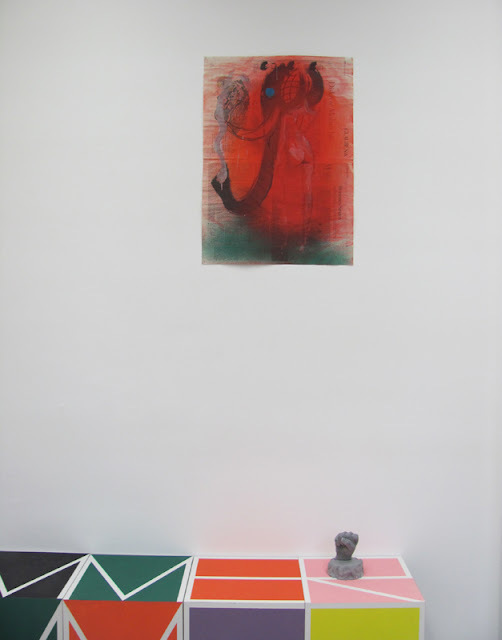 The transgression of self – the basis to renew our traditions of thought – is also the subject of recent pencil drawings that represent mythological motifs, wrath and hybrid figures. 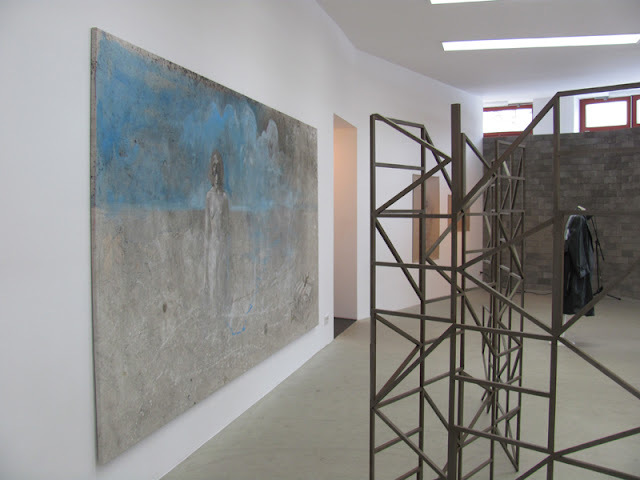 This symbolic development or passage is continued in the smaller room of the gallery. 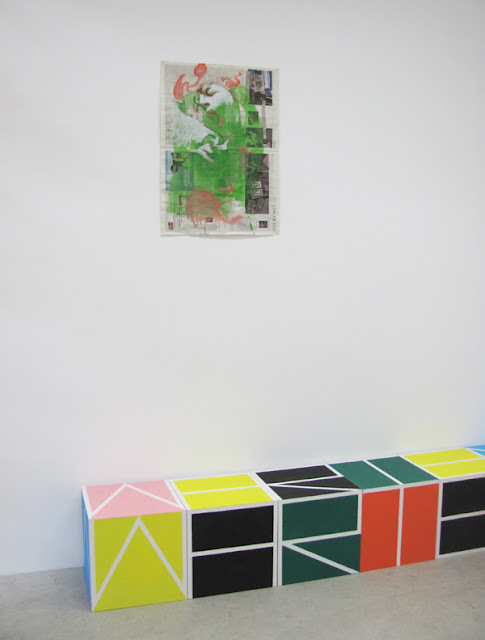 Eleven seating cubes, each of them painted with an alphabetic character, form the word WARTEZIMMER (waiting room). The Z of the word can also be read as N, so the situation can be interpreted as either eternal waiting (WARTEN IMMER / always waiting) or a call for the opposite (WARTE NIMMER / never wait). 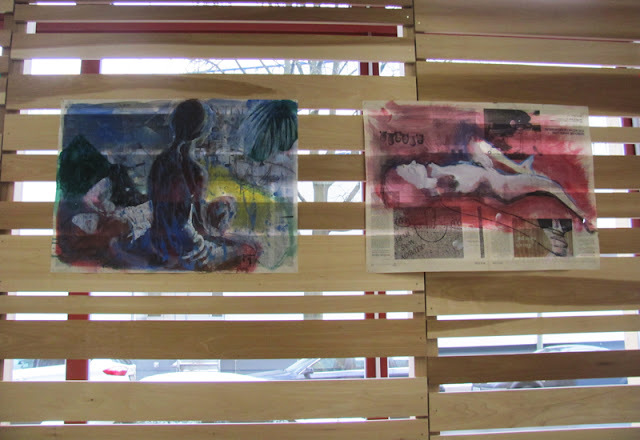 In this context, watercolour paintings on newspaper showing figures in self-reflection seem to criticise the retreat to subjectivity. 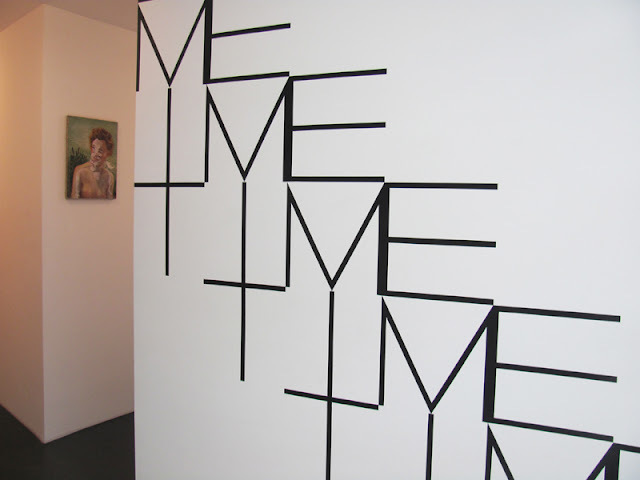 Further, a wall painting based on the characters TIME establishes a connection between time and subjectivity (ME in TIME).